It’s been a busy few weeks. Monday to Friday in the office or going out to visit suppliers or customers. The weekends has mainly been about photo shooting. I have been attending cycling events every weekend, supporting cyclists and trying to improve my strike rate of good photos. I am finding I’m being restricted a bit by using a point-and-shoot camera. It’s one of the better models but not being able to fine-tune settings means a lot of potentially nice shots don’t work out. Last Sunday was the annual Never Stop event from Shui Li in Natou to Tatajia in the shadow of Taiwan’s highest peak, Yushan. I blogged on a training run that a group did in the early winter over this route, when conditions were a bit more hostile, a few months ago. On Sunday it seemed it might have been pouring rain. The rain actually held off until midday, where from around 1800m to the top at 2200m drizzle set in. 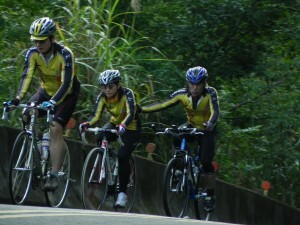 Many cyclists were still to complete the climb and found it a quite tough slog up the slope. 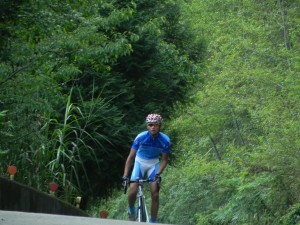 The route is 72km with the first 38 km involve a gently ascent to the base of the actual climb. From the bridge you climb continuously for 34km at around 5%, although there are two ramps of 20% and 22% that cyclists have to endure 15km from the top. Overall it’s still quite a challenging ride. The Never Stop event is divided into a competition group and a challenge group. 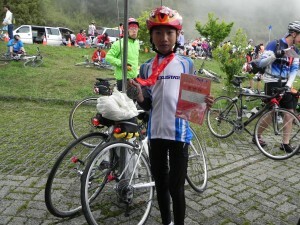 The competition group numbering 87 cyclists is the first to leave and included much of the cream of Taiwan’s racers. After they charge off, the main group departs in a progressive roll out that takes over an hour. The weather was fantastic in the early morning. This lady challenge group cyclist was enjoying the view in the soft morning light. 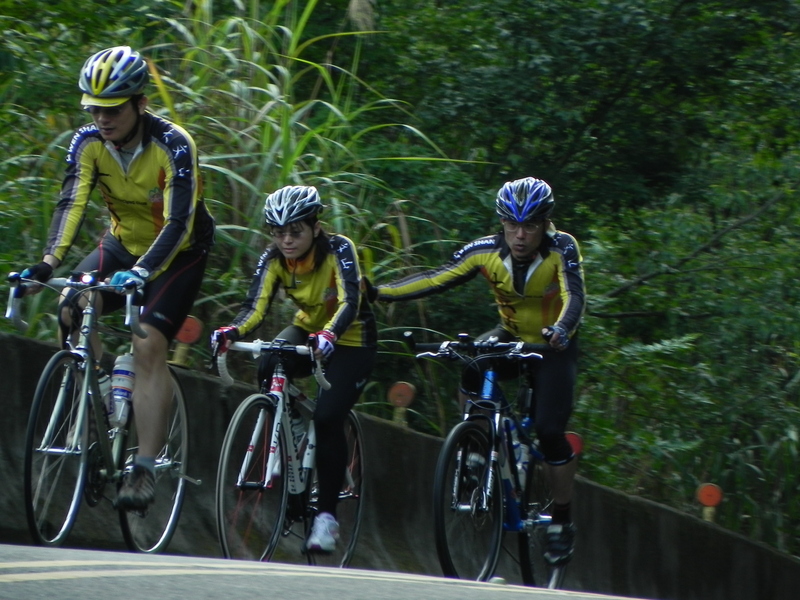 It really is a great cycling route with wonderful views across to Yu Shan. Challenge riders that set a brisk pace early on avoided the fog and rain that moved in later. Winding their way up the slope the valley falls away for hundreds of meters beside them. The leading contenders for top positions in the competitive group are 15km from the top here. In front is Shibu Zhouzhuo of Kizuna Cycling Team who took first place in 2:09:31. Just behind him is the 2nd place getter, Lin Huan-Dze of KTM. He usually the champion of the He Huan climb each year. Today he clocked 2:10:53. The 3rd and fourth place getters are behind them in that order. 3rd was Hong Jia-Hong followed by Hong Jia-Xian in 4th place. 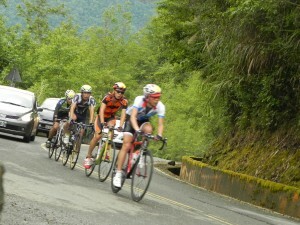 The next group not far behind them included Taiwan’s greatest climbing competitive cyclist, if you go by age. Zhu Yi-Ping (#50) is in his early 50’s and there are only a handful of younger cyclists than him who can get ahead of him at any time. Today he finished 6th overall in 2:20:39. Just behind him is Inigo Gisbert (#28), an Industrial Designer who works for Specialized in Taiwan. A veteran cyclist who hails from the Basque region of Spain, he finished 7th, just behind Zhu Yi-Ping in 2:22:34. Beginning to slip off the back behind them is Shi Dong-Li who finished 13th in 2:24:33. Because this is such a beautiful cycling route, there were many cyclists out on the road who were just doing their thing. They were a bit surprised to find increasing numbers of cyclists thundering upwards at this time of the morning. William rides in my team’s colors when he has the time. 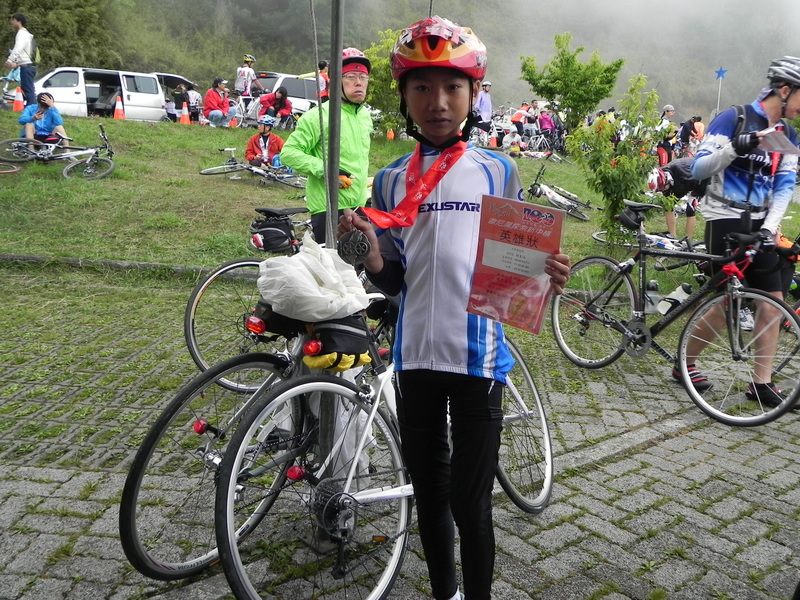 He trains during the week as a member of his senior high-school team and rides for that team in many events. He was not a part of the official event today as he only came at the last minute. Still, he set a brisk pace up the climb. 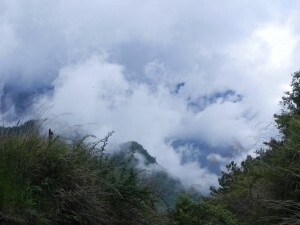 By 10am the clouds were beginning to gather and move up the valley. Not long before the rain comes. This young achiever finished in 5hrs 56min. He looked like he could have done it all again! Next event, the TUAA’s Alishan event. There’s a nice financial payoff for first place in the elite category in this one: NT 650,000.